Berkshire Trustee Bill Holtry gives a presentation about the proposed Planet Oasis development during a township trustees meeting held Monday. Despite the empty seats in the front row, the meeting drew dozens of people. 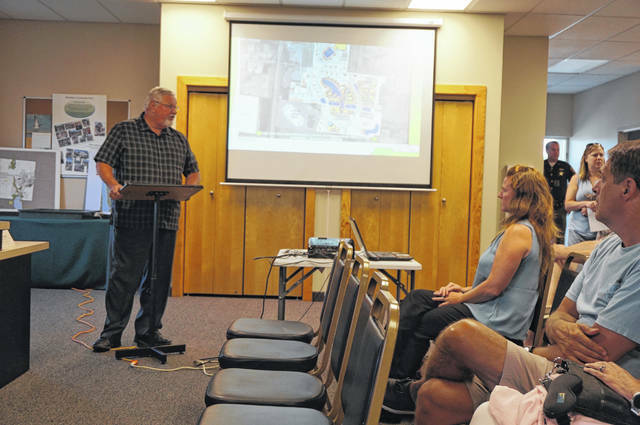 The Berkshire Township Board of Trustees devoted most of its Monday meeting to discussing the proposed Planet Oasis development and answering questions brought forth by residents. The 350-acre, multi-billion dollar resort complex across from Tanger Outlet Mall, said to offer everything from an indoor roller coaster to a lake surrounded by a boardwalk, Olympic sport facilities, convention center and a wellness spa, was announced on June 28. Since then, speculation has swirled on social media throughout central Ohio. Trustee Bill Holtry, who attended the June 28 announcement, gave a presentation on the backstory behind the development to dozens of interested attendees. He said there was a fear that the farm land would become truck terminals and warehouses. Several developers had shown the township their plans for the property, never to return again. Enter developer David Glimcher, whose past credits include Polaris Fashion Place, and who owns options on the acreage. A couple months ago, Glimcher approached the township with what he calls “the entertainment venue of the future,” Planet Oasis. Holtry said he understands Planet Oasis will be a three- or four-year project, built in phases, and dependent on success. The first phase will include a grocery store, a bowling alley designed to attract professional bowlers, movie theater and indoor golf. Phase two will be training facilities for the newest summer Olympic sports. The subsequent phases include the lake resort, wellness spa, convention and entertainment centers, all supported by retail shops, restaurants and hotels. “No one is going to spend a week here unless they’re entertained,” Holtry said of convention-goers and their families. Berkshire voters previously approved by a 3-1 margin having the site be part of a revitalization district that began with Tanger. Holtry said the district would be the extent of the commercial development. The property is already zoned for Planned Mixed Use Development, so Planet Oasis has to get the blessing of the Ohio Department of Transportation, Delaware County Engineer, and Berkshire Zoning Board before it can become a reality, Holtry said. “As of July 9, there is no final development plan,” he said. Some of the people who spoke said they were concerned with what they called an amusement park, citing increased traffic and crime. They wondered how the anticipated 15,000-25,000 jobs would be filled, and how much revenue the township and the Big Walnut School District would receive. They also said that the rural lifestyle of the township would be gone. They were asked why not attract other types of businesses, such as suppliers to Ohio automaker Honda. The trustees promised transparency, and said they are in the process of updating the township’s trail system and adding park space to help retain the rural flavor.